The Vienna Mint started minting this silver sister of the original Austrian Vienna Philharmonic Gold Coin in 2008. Each Austrian Philharmonic Silver Coin is struck in .999 fine silver and minted with extremely intricate details nearly identical to the Philharmonic Gold Coin series. The Austrian Philharmonic Silver Coin is made by the Vienna Mint, known worldwide for creating artful engravings and mastering a fine minting process. In addition to the added security of owning a premium bullion coin, the Austrian Philharmonic Silver Coin is also offered in the silver denominated euro (€1.5) option. 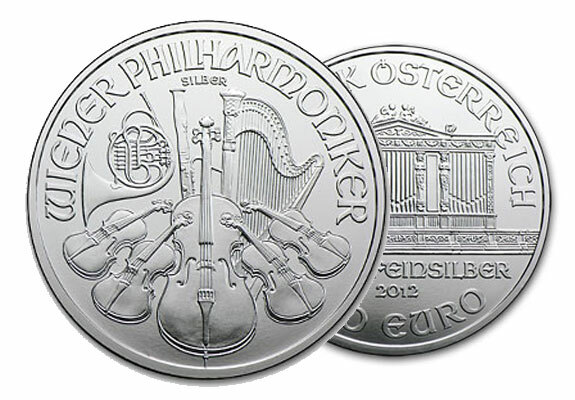 Austrian Philharmonic Silver Coins contain one of the purest forms of silver, with a purity rating of 99.99%. It parallels its sister coin, the Austrian Vienna Philharmonic Gold Coin. That coin was the best-selling gold coin in the years 1992, 1995, and 1996. The coin is particularly liquid due to its premium purity and because it is also offered in the silver denominated euro. This characteristic is unique as it is the only silver bullion coin offered in this denomination. The coin is easily converted to cash, making it a popular option for numerous smart investors. And, this coin is commonly seen as part of Individual Retirement Accounts. It is often sought by coin collectors due to its elegant design and breathtaking intricacy. The Vienna Mint is responsible for the minting of this beautiful coin. It has been in existence for over 800 years, with its inception involving a silver ransom used to free King Richard the Lionhearted of England. The Vienna Mint has developed a reputation for minting some of the most beautiful coins in the world through the use of intricate engravings and a fine minting process. Its namesake derives from the Austrian Philharmonic Orchestra, and the coin features an attractive great organ design. The reverse side of the coin also offers subtle elegance with its portrayal of a collection of other orchestral instruments. The diameter of each coin in this series is 37mm. Each coin contains one troy ounce of silver. It is only legal tender within Austria and not within the Eurozone. If you would like to add this unique coin to your existing IRA or other qualified retirement account, contact American Bullion at 1-800-362-9598 to speak with one of our precious metal specialists.